Facebook Removes Little Timmy Salutes the Flag Photo-Fiction! - Truth or Fiction? Facebook Removes Little Timmy Salutes the Flag Photo-Fiction! Given that the Little Timmy Salutes the Flag photo remains prominently displayed and easy to find on Facebook, claims that Facebook removed the photo because some people reported it as “offensive” material are clearly fiction. Facebook had the NERVE to remove the beloved photo “Little Timmy Salutes the Flag” because Americans find it “hateful.” Let’s all LIKE & SHARE to show there’s nothing hateful about AMERICA! 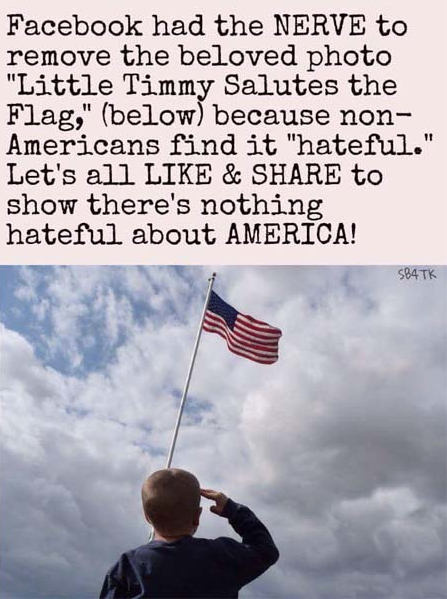 Again, the fact that Timmy Salutes the Flag photo continues to appear on Facebook would suggest that the photo has not been banned or removed for being deemed “hateful” by non-Americans. The original Little Timmy Salutes the Flag photo first appeared at the website of a flag wholesaler named Collins Flags in December 2013. The little boy in the photo is not identified, and the photo originally accompanied a blog post about how to correctly salute the flag. A group intentionally trying to mislead a prominent conservative’s supporters is behind false claims about Facebook removing the Little Timmy Salutes the Flag photo. Kim Clement Prophesied Donald Trump's Presidency, "Trumpet of God"-Unproven! Japan's Damaged Fukushima Daiichi Nuclear Reactor Falling into Ocean-Mostly Fiction!